If you ought to know more about Italy, then this magazine would be your perfect guide. It is an Italian magazine that provides news regarding important facts concerning the place Italy. It is popular for providing television guides and articles. It is easy to subscribe to the magazine. On subscribing to the magazine, one can get a couple of advantages which would be quite useful for the people wanting to learn much about the culture and entertainment options of this place. The magazine brings the latest developments in the various popular fields to the consumers. It focuses on various areas that include the majority of the audience. It gives important updates on fashion which are quite helpful for the people interested in this field. This is also of great help to the upcoming designers who are looking for inspiration. There are interviews present in the magazine about upcoming artists who have given their best with the most unique collection. The details with regard to the fabric designing and texture of the clothing are quite useful for upcoming artists. So this is a magazine also preferred by fashion freaks and designers. This particular magazine was first published in the year 1987. This is a weekly magazine whose popularity has grown over the years as they revised each of their editions with various suggestions by the audience. 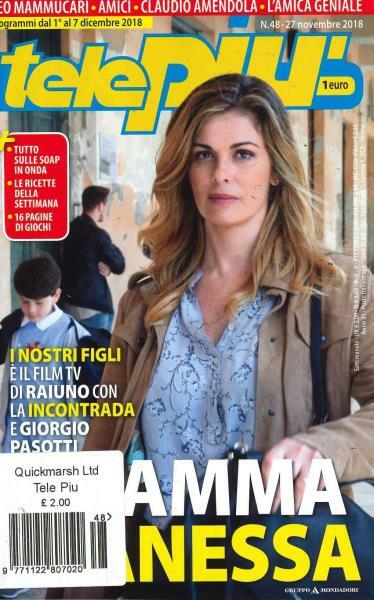 The name of the editor of the magazine is Giovanni Valhi. The average circulation of the magazine is 184, 372 copies. The readership is 978,000. It is an original guide that is quite portable so it is consumer friendly. It features cooking, health tips, quizzes, news and important information on celebrities of television and movies especially of Italy. You can live Italy thoroughly via this weekly journal and enjoy your journey through it forever.